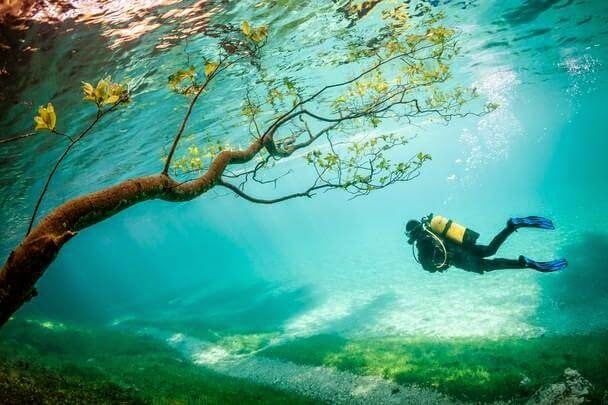 Grüner See (Green Lake) is a lake in Styria, Austria, near the town of Tragoss, known for its shimmering, emerald green hue and its fluctuating depth throughout the year; at times leaving a park completely submerged in it. During winter, the lake is only 1-2 meter deep and the surrounding area is used as a county park. It is a particular favorite site for hikers. But as the temperature starts rising in the spring, the ice and snow on the mountaintops begins to melt and runs down into the basin of the land below. The lake swells up to engulf the entire area, including the park. During summer, the lake reaches its maximum depth of around 12 meters and is claimed to look the most beautiful at this time. 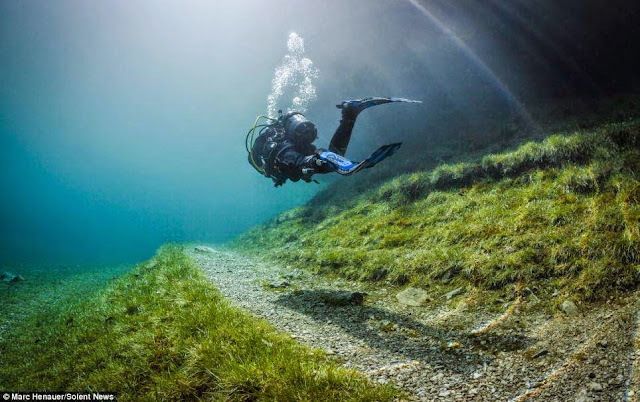 Every spring this park shifts from trekkers and gives its way to underwater explorers by turning into a literal swimming pool. 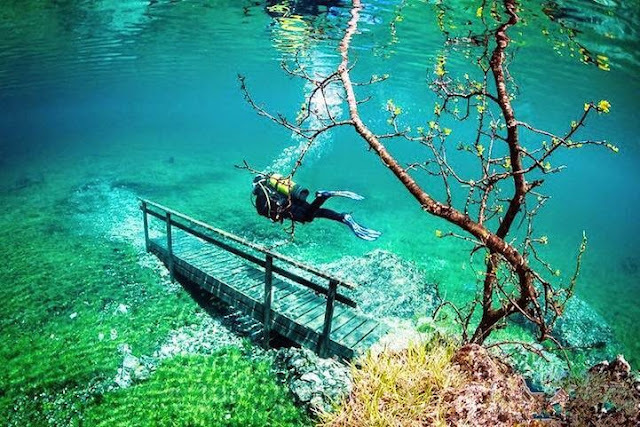 The site has proven to be an attraction for divers, inviting them to plunge in and explore the spectacular underwater park, fully adorned with a bridge and a bench. The alpine grasses and flowers of the meadow are visible in full bloom under the water. Furthermore, one can even see benches, a bridge and walking trails. 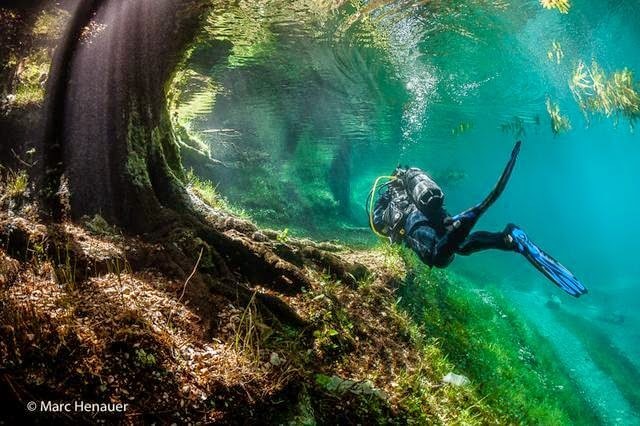 Photographer and diving enthusiast Marc Henauer was able to experience the underwater park firsthand and capture some enchanting images while down there. 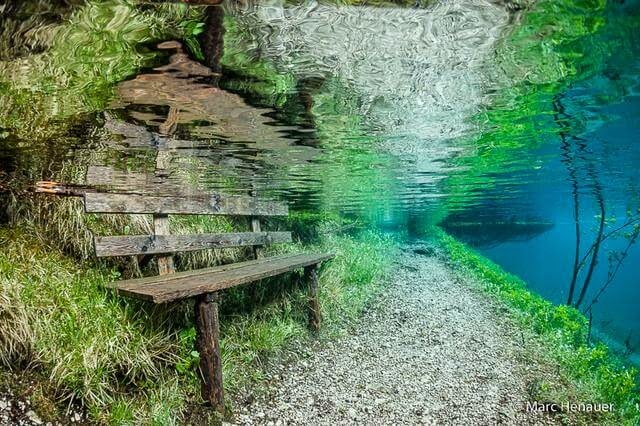 These incredible pictures of the Green Lake in Austria have won the 3rd place in the 2014 National Geographic Travel competition.